Join us for New Year's Weekend and start your year with romance! A free bottle of Champagne awaits you when you book a 3 night stay. Add our spectacular New Year's Eve Dinner Dance for an additional $75/per person plus tax and gratuity. Stay 3 nights and receive 2 free dinners at our delicious Christmas Eve feast hosted by Count Egizio Panetti. The Christmas Eve dinner menu includes Egizio's signature Venetian asparagus risotto, lasagna bianco with spinach and mushrooms , Christmas fish en paillote, Princess Ismene Chigi's Roman chicken and more. Click here to learn more about the Christmas Eve dining event. Before dinner, enjoy carolling with innkeeper Melissa on Christmas Eve from 4-5 pm! All welcome! - Holiday Inn Tours through the Wilburton & 10 other beautifully festooned country inns in Manchester, Arlington and Dorset. - Meet our New York Girls who have been decorating our Yankee Magazine Featured Christmas tree for twelve years! Click here to read about them in Yankee Magazine. A doggy slumber party with discounted lodging and no dog fees for any breed - plus a box of Wagatha's organic VT doggie biscuits for 4 legged guests. Caroling with Innkeeper. award-winning entertainer, Melissa Levis 1 - 4. After dinner karaoke sing-along 7:30 - 9pm. 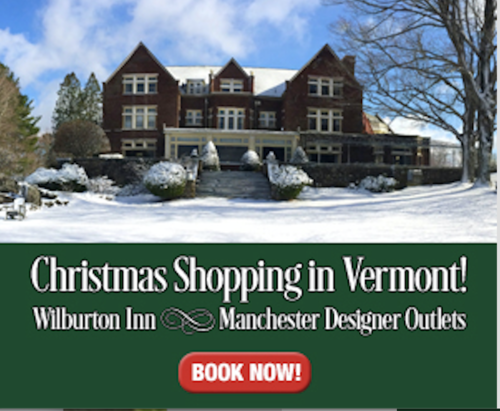 Get a $50 gift certificate and a special coupon book with savings to enjoy at all 40 Manchester Designer Outlets when you spend two nights midweek at the Wilburton Inn! The Perfect place for your Christmas shopping and Hanukkah presents. Designer outlets from Ann Taylor and Brooks Brothers to Kate Spade, Tumi and Vineyard Vines. 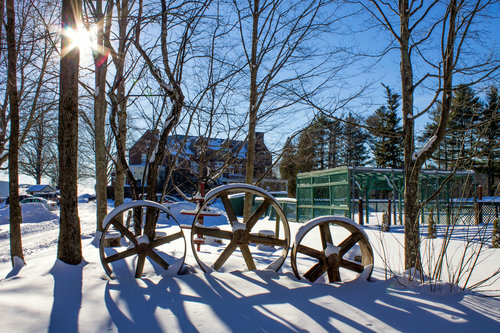 Six weeks of small town charm, snow-capped mountains, and the spirit of the season. Manchester Merriment kicks off Thanksgiving Weekend and continues through New Year’s Day. Highlights include tree lighting, tractor parade, historic inn tours, and Hildene, the Lincoln Family Home decked in her Victorian finery. Plus, festive and fun holiday markets, visit from Santa, and the Elf Express train ride for kids! Save 30% on all two-night midweek bed & breakfast lodging November 28 through May 1, 2019! Reservations must be booked directly through the Wilburton Inn front desk at 802-362-2500. Join our third annual Howl'oween Weekend and Canine Costume Ball! • Canine Costume Ball on Saturday 2 - 4 pm. • Wagatha's Dog Biscuit Company will award the grand prize and a prize for every pooch. Pursue your passion for the game at The Golf Club at Equinox while staying at the Wilburton Inn! As part of this package, Wilburton lodgers receive reduced rates at the course, which is situated barely a mile away. Named to the "best in Vermont" list by both Golf Digest and Golfweek, the surrounding mountains provide an unforgettable backdrop at this par 71 6.423 yard Rees Jones/ Walter Travis 18-hole championship design. Click here for more information on the course. Innkeeper Melissa returns to the stage and performs a cabaret on Saturday night of songs inspired by her mother, Innkeeper Georgette. Join us for 1 night lodging and save $5/pp on Mother's Day Brunch. Click here for the Mother's Day Brunch menu. Celebrate your 4 - legged children on Mother's Day Weekend! Join dog lovers from across the country with our canine slumber party. No dog fees for any breed. All dogs get a gift of treats from Wagatha's organic doggie biscuits. Enjoy a group doggie stroll in Manchester Village, VT. Enjoy bonding with other dog enthusiasts! Free bottle of champagne and a box of artisan Wilburton chocolates with 2 night minimum stay - so the parents can have as much fun as the kids! Skiing continues at Stratton thru mid April. Discounted tickets to Hildene with the goat farm and Pullman car, hike at Equinox Pond, shop at the best penny candy ever for Vermont Country Store. Enjoy special discounts at the Manchester Designer Outlets. Special for new reservations booked directly through the Wilburton. Join us for a 3-day weekend, and enjoy a $25 gift certificate to Earth Sky Time Farm at the Sunday Dorset Farmers Market. Bring home loaves of the incredible hearth baked bread that we serve at the inn, plus fruit pies and organic greens from our very own family farmers Oliver & Bonnie Levis and their team of international, inspired young farmers. New reservations only. Cannot be combined with other offers.